This application notes is written for junior engineers, technicians, purchasing managers, program managers who are involved with the design and procurements of Common Mode Chokes and filters. It is intentionally written with almost no mathematical expressions, and explained in its most basic and simplest format so that it can be easily understood. With the advances in materials and thousands of different common mode products to select for a given application, it is advantages for end users to understand how to select proper devices that are suitable and cost effective that can get the job done. Almost all electronics circuits require the use of COMMON MODE CHOKES to filter out the conducted switching and Radio Frequency noise coming from the power sources such as Switching Mode Power Supplies (SMPS) or other line power outlets. These high frequency noises from SMPS can affect the performance of other electronic devices connected to the same power source, causing potential failures. The common mode choke, as the name suggests, is used to filter out electronic noise that are common to both the power ("live") and the return line. In other words, the common mode choke is used to filter out the electronic noises that are coupled to both the power and the return lines. The engineering community has established limits to these electronics noise with standards such as EN 55011. COMMON MODE CHOKE is typically used with capacitors and differential mode inductors to form a complete filter in an electronics circuits. Figure 1 shows a typical COMMON MODE CHOKE connection. Typically, COMMON MODE CHOKE is wound on toroidal core, gapless H core or EE core. The most common material used is high permeability manganese zinc ferrites for low cost applications. In high end applications, Co-based amorphous, Fe-based amorphous and Fe-based Nanocrystalline cores materials are used. Common trade names for Amorphous and Nanocrystalline are METGLASS, FINEMET, HITPERM, VITROPERM, NANOPERM, etc. Please note that CWS is not affiliated with any of these companies. COMMON MODE CHOKE is wound with 2 identical windings, where the current in each winding flows in the opposite direction to each other. For example, the current from positive terminal of the power source will flow into the COMMON MODE CHOKE’s first winding and the return current will flow into the COMMON MODE CHOKE’s second winding before it gets to the negative terminal of the power source. The live and return currents are of same magnitude since they are from the same power source. But, the direction of the magnetic flux lines created by the current flowing into the first winding is opposite to the flux lines created by the return current into the second windings. These 2 magnetic fluxes cancel out each other creating a theoretical net flux of zero. But in real life, there is stray magnetic flux which will minimally attenuate the main currents. Since the net magnetic fluxes due to the main current flows are zero, the cores will not go into magnetic saturation in a COMMON MODE CHOKE design. Therefore, COMMON MODE CHOKE’s core will not saturate due to the amplitude of the main currents. For example, a magnetic core that usually saturates at 5 Amps in a differential mode application will not saturate even at 100 Amps in a common mode application provided the 2 currents flowing in and out of the COMMON MODE CHOKE is of equal value or from the same source. The current rating of COMMON MODE CHOKE is determined by the resistance of the windings which causes temperature rise. However, the high frequency electronic noise currents which are of much lower amplitude and riding on the main positive and return line will encounter high impedance from the COMMON MODE CHOKE and will be severely attenuated, and therefore filters out. To design the COMMON MODE CHOKE, the following design practices are used. 1) Use of highest permeability magnetic core materials to get the highest impedance or attenuation of the noise frequency spectrum. 2) Use of magnetic core with suitable saturation flux density to ensure core does not go into saturation from high electronic noise amplitude or any unbalanced main currents. 3) Use of magnetic core with good thermal stability. 4) Use of maximum windings for a given magnetic core dimension to get the highest impedance. 5) Use of minimum sized magnetic core for any given impedance to reduce the size of the COMMON MODE CHOKE. 6) Space the windings to reduce the parasitic capacitance. 7) Size the winding wires to get acceptable temperature rise due to wire resistance (I2R). The core selected must provide the highest impedance over the range of the noise frequencies to be suppressed. For noise generated from SMPS, the frequency range is typically 20 KHz to 300 KHz. But with harmonics, this noise frequency could be up to 10 Mhz. For inverters, the noise frequency is from 10 KHz to 30 Mhz. 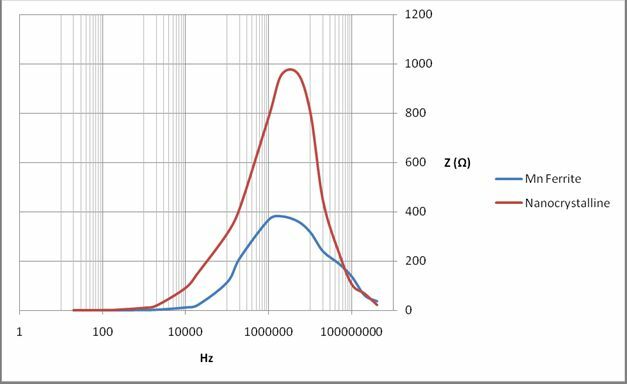 As can be seen from Coil Winding Specialist Inc ("CWS") Common Mode Chokes’ data sheets, the Impedance versus Frequency graphs shows the highest impedance are from 1 Mhz to 10 MHz range. The lowest cost COMMON MODE CHOKE is made of MnZn Ferrite cores. The permeability of these ferrites is in the 5,000 to 15,000 ui. Over 80% of all COMMON MODE CHOKE used in the world today are made using ferrite cores. The major advantage of using ferrite cores for COMMON MODE CHOKE is low cost and short lead time due to availability of the material. The major disadvantage of using ferrite cores is the temperature stability and saturation of the ferrite material. a) Very high permeability, typically from 20,000 to 200,000 ui which reduces the size of the component. b) Saturation flux of 1.25Tesla, which is over twice the saturation flux of ferrites which is less than 0.5Tesla.Higher saturation means that it can handle higher noise amplitude or noise currents, and higher current differential between the live and return main currents. c) Curie temperature of 330 deg C as compared to 220 deg C for ferrites which means that it can be used in much higher temperature applications. d) Good temperature stability with a working temperature of 200 deg C as compared to 120 deg C for ferrites. e) Absence of magnetostriction and audible noise. High permeability ferrite cores have magnetostriction behavior causing the permeability to drop off substantially when physical pressure such as winding pressure is applied to the core. The major disadvantage of using nanocrystalline cores for COMMON MODE CHOKE is the higher cost and longer leads time in many cases. Coil Winding Specialist Inc. (“CWS”) has recently introduced a line of COMMON MODE CHOKE based on amorphous and nanocrystalline cores at a reasonable cost and with short lead time, in addition to its regular suites of ferrite based COMMON MODE CHOKE. CWS is able to procure amorphous and nanocrystalline cores at a reasonable cost by partnering with manufacturers, and by increasing its usage volume and is stocking many sizes of the cores at its factory to reduce the lead time. Amorphous and nanocrystalline cores are made of thin ribbon film of glassy material coiled together into a core. The material is fragile and breaks easily like a glass. All amorphous and nanocrystalline based COMMON MODE CHOKE from CWS is wound on these ribbon cores that are potted inside a high temperature plastic case that are encapsulated and vibration tested and drop tested. Other materials used in COMMON MODE CHOKE are Co based amorphous. The Co based amorphous has permeability of over 100,000 ui, saturation flux of 0.6 Tesla, Curie temperature of 210 deg C and working temperature of 90 deg C. But the lower cost Fe based amorphous has permeability of 30,000 ui, saturation flux of 1.7 Tesla, curie temperature of 600 deg C and working temperature of 100 deg C. CWS does not offer any COMMON MODE CHOKE manufactured using the Co based amorphous materials at this time due to cost and availability. INSERTION LOSS AND IMPEDANCE OF COMMON MODE CHOKE. Where V1 is the voltage between the voltage source and the load before the insertion of the COMMON MODE CHOKE, and V2 is the voltage after the insertion of COMMON MODE CHOKE. For frequency below 2 MHz, the insertion loss or |Z| is due to the impedance of the COMMON MODE CHOKE. For frequency above 2 MHz, the insertion loss or |Z| begins to drop due to the inter-winding capacitance. Reducing the number of turns or space out the windings in a COMMON MODE CHOKE design to minimize the inter-winding capacitance can extend filtering range of the COMMON MODE CHOKE. The self resonance frequency (SRF) of a common mode choke shows where the peak insertion loss occurs.The Commom Mode Choke to select should be those where the SRF is close to the frequency where the highest noise amplitude occurs. The datasheet from CWS shows the |Z| versus frequency for all the nanocrystalline line of COMMON MODE CHOKE as it is easier to measure and characterized them during production. The graph below shows the Impedance |Z| versus Frequency for Common Mode Chokes based on ferrite core and that of nanocrystalline core. The size of the 2 cores is the same, and the number of turns and wire size are exactly the same. As can be seen from the above graphs, the Nanocrystalline Common Mode choke provides damping of the noise frequency over a wider frequency range. The impedance or the insertion loss is over twice that of the ferrite core common mode choke. Nanocrystalline core is particularly suitable for use in 3 phase common mode chokes. CWS now offers 3 phase common mode chokes wound on 3 inch nanocrystalline cores that meets the safety requirements for spacing. Based on the data obtained by CWS from our laboratory, we have found that the size reduction of the common mode choke using the nanocrystalline core can be from 50% to 75% as compared to that of ferrite core based common mode choke. CWS offers hundreds of types of Common Mode Chokes in various configurations, sizes, current ratings, and applications. Most of the CWS’s hundreds of types and configuration are available in stock for prototyping and sampling. Small quantities can be ordered directly from our website. The various types are categories by the current rating, and will be described briefly here. CM, PM and C Series of Ferrite Toroid Common Mode Choke. 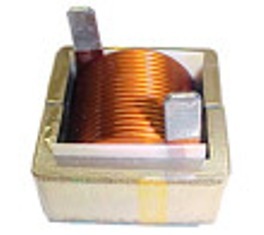 This series delivers the highest current rating up to 100 amps is wound directly onto the highest permeability coated MnZn ferrite core to achieve the most compact size. The wire used in the windings are rated at 200 deg C, and are usually wound as a single layer to increase the range of the noise frequencies (up to 1 MHz plus harmonics) to be attenuated. Together with low cost and fast delivery, this series is suitable for Dc/Dc converters and compact SMPS power line filtering and RFI/EMI filtering to meet FCC or VDE requirement. This series is wound on a nylon case on a mid to high permeability ferrite MnZn ferrite core. This is a versatile series and covers almost all types of common mode filtering applications. The HL, S and LF class are each designed for application ranging from wide noise spectrum to high insertion loss or high impedance. The current rating is from 1 amp to 30 amps. Multi-layered windings are used to increase the insertion loss or impedance (derived from inductance) of the LF sub-series. This series is good for application where the noise amplitude is high. Application includes switching regulators, noise from ultrasonic equipments, contact noise, inverter noise, etc. The gear wound common mode choke are built using MnZn ferrite H-cores. The H-cores are solid ferrite piece E-E with no gaps. The mounting structure consists of a frame and header with 2 split semi-cylinder shaped bobbin pieces that are clamp together over the center leg of the H-core. Once the 2 split pieces are clamped together, the outer edge of one side has gear teeth. The winding machine has a gear that connected to the bobbin’s gear teeth and wires are fed into the multi-slot clamped bobbin. This design originated from Japan many years ago to automate the windings of common mode chokes for very high volume mass production. The 20, 24, 28 and 35 series of common mode chokes are for application where size is not an issue, and where very low cost and very high volume is desired. They are available in vertical and horizontal mount. The main application is power line noise filtering to meet FCC or VDE requirements, and used in consumer electronics, test equipments and other bulky devices such as printers, copiers, medical equipments, machines, etc. These common mode chokes are designed with amorphous and nanocrystalline cores with the permeability of 50,000 ui, with good saturation flux density. Using similar case sizes as the HL series, this series offers the highest insertion loss or impedance. This series is suitable for application where the extreme temperature range is required, high impedance over a wide noise frequency is needed, high noise amplitude, high main currents, and small size. Application includes military, aerospace, transportation, medical and other high end application. The 3 phase common mode chokes are wound on high temperature case material. The nanocrystalline material used has a permeability of 50,000 ui with a saturation flux density of 1.25 testla. These are design for high power application, and are used to filter 3 phase line noise. Application includes solar and wind energy generations and other equipments requiring 3 phase power.